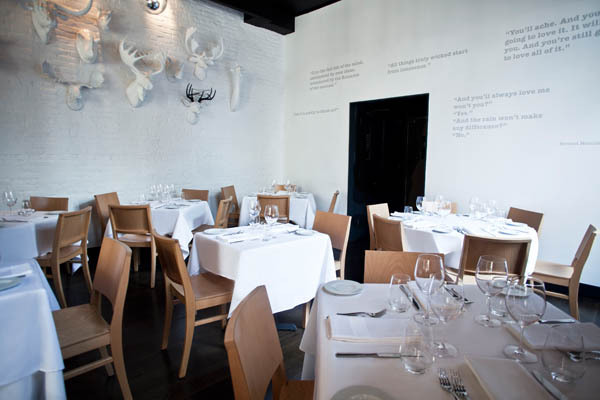 The joys of an emptied out NYC in the summer means an easier time to score reservations at some of NYC’s favorite places. 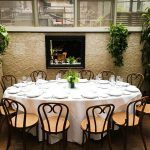 From experiencing the culinary journey of a formal Japanese kaiseki dinner to dining at one of NYC’s most revered Italian restaurants there are plenty of options for satiating your gastronomic cravings. The Kitano Hotel sits on 38th and Park, a stone’s throw away from the Chrysler Building, Empire State Building, and Herald and Times Square. 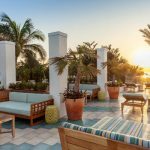 Whether you’re just here to visit the city and seeing the sites, or you’re a native New Yorker, there’s no denying the location is ideal and convenient. 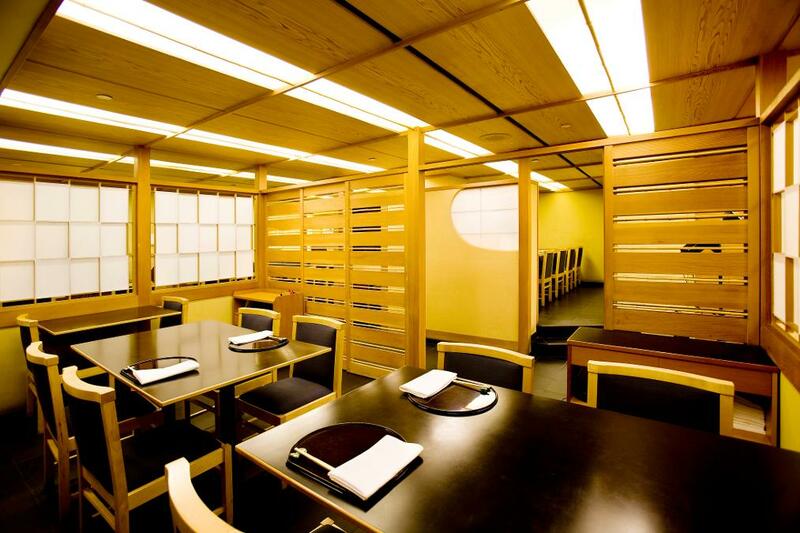 If Kitano is the location, then it’s restaurant, Hakubai, is the main event. 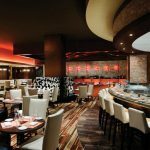 Despite being surrounded by other Japanese restaurants, Hakubai can’t help but stand out: a mix of modern and traditional Japanese cuisine, the quality of the food and the restaurant’s atmosphere are unparalleled. Upon entering, the restaurant’s decor and design immediately impress. You may be wary about eating downstairs and not on the ground floor, but this is exactly how the restaurant meant to design it. The walls painted a pineapple yellow, both vibrant and mellow, the atmosphere is extremely intimate and serene. The dark wood tables perfectly complement the yellow, and though some rooms have different designs, the colors remain constant and perfectly paired. This serenity is part of Hakubai’s goal: it serves to create a sort of Zen Buddhist feel. If the design is calming and Zen-like, then the food is what confirms it. Made in the Kaiseki style, a prix-fixe multi course meal served on an exquisite array of porcelain, pottery and lacquer dishware at carefully timed intervals, the food is the epitome of Japanese haute cuisine. All the ingredients are local and with fish so fresh it almost melts in your mouth. You just might reach a state of nirvana. 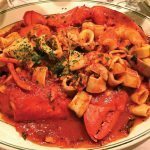 If you’re looking for a great Italian restaurant in downtown New York, look no further. 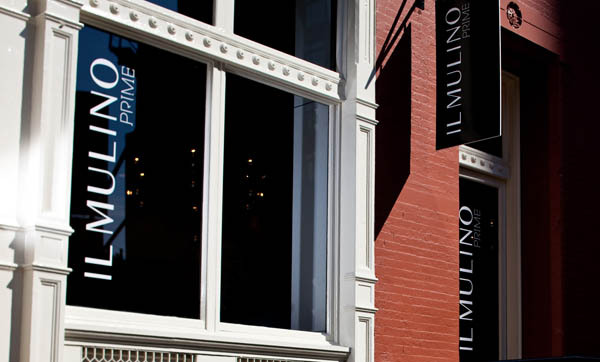 Located in the heart of SoHo, Il Mulino offers an haute cuisine approach to Italian cuisine, perfect for any occasion. Romantic date? Dinner with the parents? Just an evening out? Any occasion you can think of is perfect for this restaurant. Based on the location alone, not only are you in the amazing neighborhood of SoHo, but you’re also a temptingly close distance to LaDurée, Dominique Ansel Bakery and Bloomingdales’s. However, Bloomingdales’s might end up becoming the sole lure, as it’s truly impossible to resist the mouthwatering desserts at Il Mulino Prime.The restaurant is perhaps best characterized as an upscale steakhouse with an Italian twist. Modern yet also taking inspiration from the culture and feel of New York, the choice cuts and unique cuisine are truly seductive. 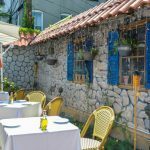 By day, the restaurant is filled with light and exudes an atmosphere that is almost freeing; what a respite from shafted New York apartments! By night, the atmosphere is intimate and comforting, the modern white fixtures and the design’s classic lines lit in a warm glow. The dinner menu includes a delicious combination of shellfish, pasta, seafood and top quality meats. 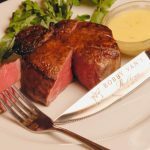 Chef Michele Mazza’s filet mignon is cooked to perfection and pairs beautifully with a truffle butter sauce. All you need to do is select a bottle of red with the help of the wonderful service staff and you are sure to have a meal and an experience to remember. We all have our local bar where maybe we’ll go and catch the game and have a cool, refreshing drink. What’s better than getting together with all your friends and enjoying a sports night, complete with an energetic and enthusiastic sports crowd? It’s almost as good as watching the game live. So what’s the problem then with your local bar? Well, typically the food isn’t exactly appealing, and maybe there’s just the one screen, and just the one game playing. We all know there’s more than one game happening on a certain night, why shouldn’t you be able to multitask? Not the dark and somewhat seedy atmosphere of many sports bars, Campeon is a bar and restaurant with an atmosphere all its own. With a whole array of creative lighting, bamboo chairs and rustic tables, this bar/restaurant has a wonderful urban feel to it. The space is also intensely colorful and vibrant: yellow ceilings, different colored walls (everything from brick to magenta-painted wood), and a mix of wood and mosaic floors, this place exudes fun and positive energy. But the main plus? There are high definition flatscreen TVs located all over with different games playing for your convenience; no more neck craning and frustration. 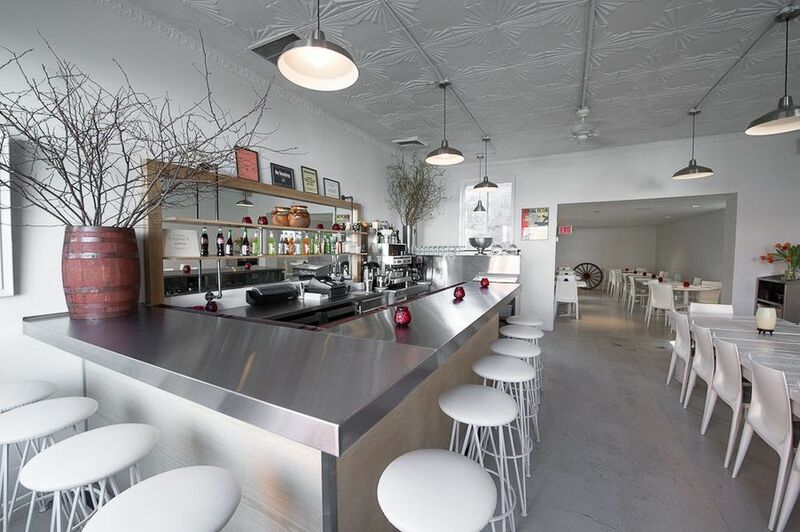 On top of being a bar, Campeon also serves Mexican food with a Manhattan twist. From tacos and guacamole to a Mexican approach to sandwiches and burgers, this place truly has it all. So maybe tonight, instead of heading to your local bar to watch the game, head over to Campeon. 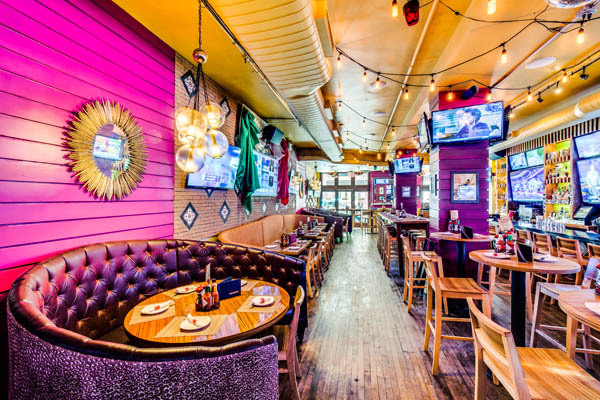 Located just off Union Square, have a Margarita and enjoy the amazing sports coverage and high-energy crowd! It can be hard to find good Mexican food in New York City, and you’ve probably tried a million different restaurants to find that one special place. Well look no further. 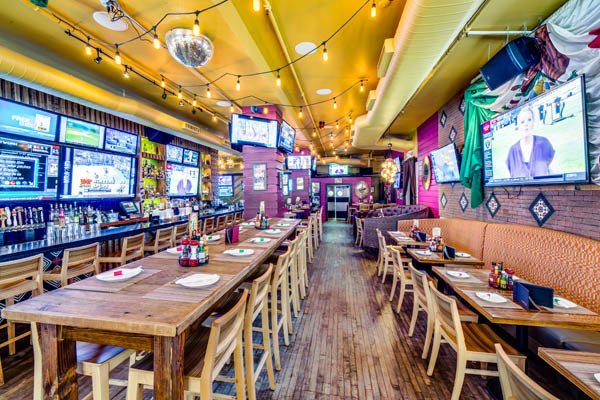 Located in Queens’ Long Island City, Casa Enrique offers the ultimate Mexican experience with an upscale twist. His passion for food being first sparked in his hometown of Chiapas in Mexico’s southernmost state (borders Guatemala), Chef Cosme Aguilar moved to New York with the ambition of becoming a professional chef. First starting in a French restaurant, he worked under a variety of French chefs over a period of ten years before eventually becoming an executive chef himself. 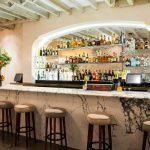 He decided to open his own restaurant which launched in 2014, Casa Enrique: though primarily focusing on Mexican cuisine, Chef Cosme Aguilar brings a unique French structure and touch to it. Shortly after opening the restaurant, he received the dream of all dreams for a chef: a Michelin star. The restaurant’s food is simply perfection, all ingredients so fresh and flavorful they melt in your mouth. 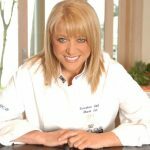 The dishes may have familiar names, but they always contain a dash of surprise; it could be a flavor you weren’t expecting or an interesting design. Even better: the food is reasonably priced, making your new favorite restaurant that much more accessible. To complete the experience, you just need to start with a refreshing cocktail and end with a sumptuous dessert. My recommendation? Try the Casa Enrique Margarita and the Pastel Tres Leche, you won’t be disappointed.